I have been posting for a while now, so I thought it would be fun to create a cloud with the topics that I have been discussing in this blog so far. Here it is. I think it gives a good overview of my research interests at the moment. Hope you enjoy it! You may be already familiar with the controversy that a couple of newspaper articles have generated regarding the tweets of Lisa Adams, a woman who is terminally ill, and who has been openly blogging and tweeting about her journey as a patient diagnosed with an incurable cancer. She is not alone in doing this. Dr Kate Granger is also a young woman diagnosed with a terminal cancer, as well as a doctor. She too has chosen to share her experience online, including very personal feelings and pictures of her ordeal. the irruption of the Web 2.0 has fostered a paradigm shift within the healthcare landscape. In my opinion, the debate about patients’ tweets is a symptom that shows how the establishment struggles with this new paradigm. I think it’s interesting how so many people are scared of social media, because it gives power to the people. Until now, it was just us (doctors, journalists, politicians, scientists…) who told things the way we thought they were. Our vision of the world was the right one, and “the lay person” listened. But now, with the Web 2.0 (and this includes social media), everyone and anyone can tell things the way they think they are, and our version of the story is no longer the right one. And we are forced to listen. It is time that the self-appointed experts give some room to the patients, because thanks in part to social media they are going to take the centre stage whether you like it or not. After all, is this not the essence of patient-centred care? * Just to make this post easier to read, I chose to simplify and use the word “doctor”. Of course I mean the medical establishment, including nurses, psychologists, psychiatrists, physiotherapists and so on. I’m sure you understand what I mean when I say “doctor”. It is not often that I come across a paper that I find not only interesting, but also useful. And it is even rarer for me to read a scientific paper about social media that tells me something I did not know already. As other fellows geeks will very well know, real news about social media nowadays come almost exclusively from blogs and from Twitter. 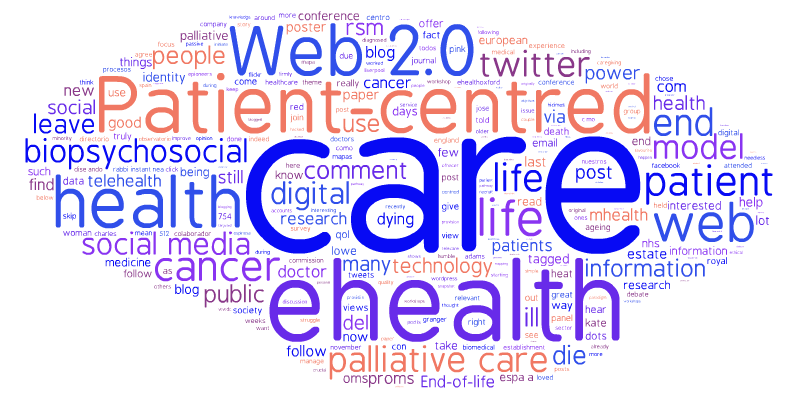 So I was very pleased to find Craig Nicholson’s brief paper titled Palliative care on Twitter: who to follow to get started. In it, Nicholson suggests a number of Twitter accounts to follow, if you are interested in palliative care. Not only does he list a few of them (such as @kesleeman AKA Dr Katherine Sleeman, @EAPCOnlus AKA the European Association of Palliative Care or @thewpca AKA Worldwide Palliative Care Alliance, among others), but he also describes the account in a short paragraph: who is it, and what will you get from them. It is very refreshing to see that despite all the social-media-hating-dinosaurs in the health care world, there is still a minority of e-pioneers getting good publications out there, and this is one of them. If you are new to Twitter and interested in palliative care, this is the paper you need to read. My colleague Marta Wanat and are presenting a poster on the Use of social media to recruit participants in cancer care research to the International Psycho-Oncology Society IPOS 2013. For those of you not attending the conference, you can find the PDF of the poster here. 1. Department of Health. (2012). National cancer patients’ experience survey programme. 2012/13. 3. Reed, E., Simmonds, P., Haviland, J., & Corner, J. (2012). Quality of life and experience of care in women with metastatic breast cancer: a cross-sectional survey. Journal of Pain and Symptom Management, 43(4), 747-758. 4. Steinhauser, K. E., Clipp, E. C., Hays, J. C., Olsen, M., Arnold, R., Christakis, N. A., . . . Tulsky, J. A. (2006). Identifying, recruiting, and retaining seriously-ill patients and their caregivers in longitudinal research. Palliative Medicine, 20(8), 745-754. An app a day keeps the doctor away… Does it? Should it? More and more, we read in the media that an app a day keeps the doctor away. It is a catchy phrase, yes. But I find it unsettling that it is heard so often, because it seems to imply that eHealth is a substitution to traditional medicine. From my point of view, eHealth is not a substitution, but an addition to health services. An addition that will improve health services, empower users and increase knowledge both for patients and health professionals. eHealth is progress, is the natural evolution of health care, but it is not the end of health care. Purely digital interventions: these are web-based health interventions where there is no interaction with the health care professional at all. Everything happens online. An example: the app MyFitnessPal, where people can track their nutritional intake and other variables, and act on their health based on this information. Hybrid interventions: where there is a mixture of digital action and human interaction. An example: interventions which use augmented reality (AR) combined with traditional cognitive behavioral therapy (CBT) to treat phobias. Each have their own advantages and disadvantages, which I will cover in another post. But my point is that eHealth cannot be seen as a separate element from health care, or an alternative. Whether it is purely digital or hybrid, in order to be effective, eHealth must always be embedded within health care services. Furthermore, it will scarcely work if the medical community sees it as a threat. I can see that “an app a day keeps the doctor away” can be read as a way of empowering patients, and this is good. eHealth responds to a change of paradigm, where people take ownership of their health issues in a way we have never seen before. But it is also a shallow, easily misinterpreted statement. So I think we must be cautious when we use these kinds of statements social media: not everybody is familiar with the field of eHealth, and it may lead to attitudes that could be damaging in the long term, both for users and for professionals. → Make sure your post entry is linked to from other web pages. This can be achieved by linking to other blog posts (either yours or others’), or linking to your blog from your professional profile page. → Make sure your post is easily readable: use headers, bold text, (not too many) colours and fonts. Make it as visual as you can, and use images. But remember and respect copyright. → Make sure you use social media to publicize your post: tweet about it, write a brief LinkedIn update on it, and so on. Remember, social media is a conversation and if you don’t talk no one will hear you. → Make sure your post is searchable. Tag it. 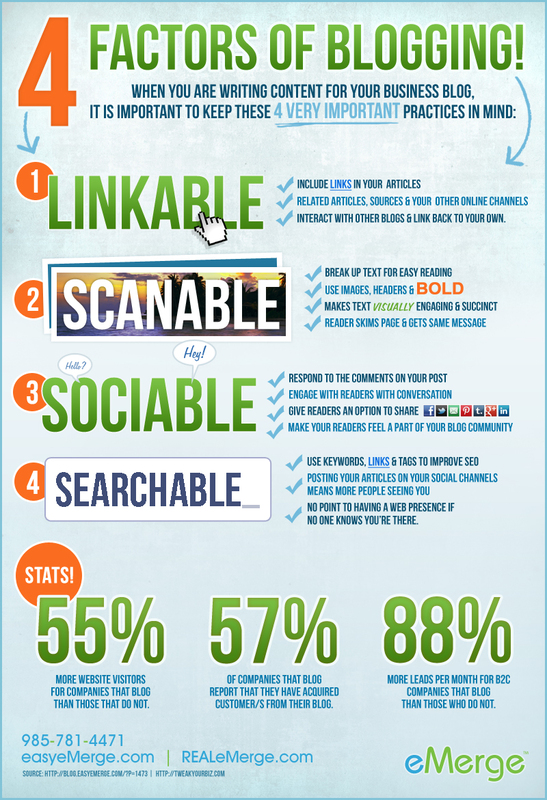 Use a Google-friendly URL. See my URL up there? Don’t just use a random number: ensure that the URL for your post reflects what you are talking about. These were my own reflections on the excellent infographic below. Enjoy!